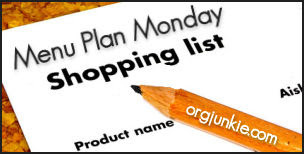 Menu Plan Monday is back again. I'm still in line with my regular schedule, although I haven't had a chance to do my usual once a month cooking to fill up the freezer with a few meals. So, I threw in one extra Rachael Ray meal this week and bought a quicky frozen meal at the store to tide me over another week. People, I need to get my act together! !